Last week’s season premiere of The 100, while strong, certainly had a lot going on in terms of plot. It was a bit overstuffed, even while the action and character work remained strong. Considering it was the first in what’s essentially a two-part premiere separated by seven days, that clutter makes sense. That’s especially clear tonight, as “Wanheda: Part 2” not only operates as a solid stand-alone episode, but also builds upon the events of that premiere, casting them in a new light and adding context. That context is absolutely needed at this point as The 100 is clearly expanding its scope in its third season. Relationships sit at the heart of this show, whether romantic, platonic, begrudging, or beneficial, and they’re often a knotty mess. It’s what drives and anchors the drama and violence. “Wanheda: Part 1” boasted some good action sequences and insightful thematic work built upon the fallout of last season’s devastating events, but it was undeniably a bit muddled when it came to teasing out new character dynamics following a jump forward in time. “Wanheda: Part 2” works to fix that by focusing on how everyone is aligned (or not) with those around them. “Wanheda: Part 2” makes relationships the clear focus right off the bat. 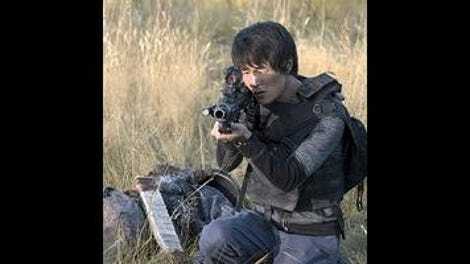 After Bellamy, Kane, Indra, Jasper and Monty are forced from their vehicle after the ambush in last week’s episode, the beacon is taken from Monty and a knife held to his throat. He might have been killed if it wasn’t for the fact that one of the raiders is Monty’s mother. The raiders, led by Pike, are all former members of the Ark, as they stand down and reconnect with Kane, Bellamy, and the rest, though remain wary of Indra. Pike fills them in on the details of their life so far: they lost a number of men near the Farm Station, inside Ice Nation territory. When they first landed, Monty’s father saved a number of children after they were playing in the infected snow, but many of them died. When he was trying to save more, a Grounder got to him. “We’ve been Grounder killers ever since,” says Pike to a roar of confirmation. Thus, it’s not just Monty’s familial relationship that’s important, but also the relationship between these former Ark members, the Sky Crew, and the Grounders. The Sky Crew has formed an alliance with the Grounders against their common enemy, but the former Ark people don’t see things quite the same way. Pike sees no discernable difference between the Grounders and Ice Nation, and it’s a perspective that’s sure to cause conflict in the near future. Really though, there’s conflict everywhere, bubbling, steaming, just waiting to boil over. How the characters navigate these relationships and conflicts is where The 100 hits its stride; it’s what the show does best. For instance, Clarke is now the captive of Roan, a rogue member of the Ice Nation who’s looking to get something out of delivering Clarke to his Queen. The perspective is that he’s a heartless slave of his brutal people, willing to hand over Clarke if it gets him what he wants. While part of that might be true, the character of Roan changes based on perspective. At the end of the episode, he delivers Clarke to Lexa rather than to the Ice Queen. But why? Well, as we find out, he’s the son of the Ice Queen and is perhaps on the outs with her. But he’s also imprisoned by Lexa. Where does his allegiance stand, and what is his goal and motivation with kidnapping Clarke? It’s not clear yet, and it’s in those murky waters that The 100, and “Wanheda: Part 2,” finds a lot of meaningful character work. Ever since the back half of season one, this show has thrived by making sure character dynamics are just that: dynamic. “Wanheda: Part 2,” coupled with the premiere, proves that that’s still the case. Of course, while it’s the intimate relationships (both violent and loving) that add depth to this season so far—think Bellamy’s pained look when he catches a glimpse of Clarke and yet can’t follow her, or when he does finally find her but can’t save her—there’s also the uneasy peace between warring forces. The tension between the Sky Crew, the Grounders, the newly found members of the Ark, and the Ice Nation (also known as the Azgeda, as it’s said in Trigedasleng, the Grounder language) is tenuous at best; a truce is in place, but there’s certainly not a whole lot of common ground and understanding amongst the groups. It’s in this political stalemate that, as with the character dynamics, The 100 shows its nuance. The 100 often operates in a moral and political gray area, meaning that there isn’t a single side in the tentative peacetime that doesn’t have some sort of justification for their more aggressive tendencies. The Grounders and the Sky Crew share a common enemy and have had each other’s backs before, and yet Lexa betrayed them. The newly found Ark people can hardly be blamed for still holding a grudge against the Grounders, considering they only know their violence and hatred. Even the Ice Nation, based on what little we know of them, seem to operate within a defined system of imbalanced power; the men who try to take Clarke from Roan just want to improve their status within that system, presumably ruled rather staunchly by the Ice Queen. Early in this season, The 100 is weaving quite an intricate story about power and relationships. It’s in the way Clarke sees herself in Roan, and the way he dismisses that assessment (“I was banished; nothing like you.”). It’s in the way Jaha is on the path to “enlightenment” (scare quotes very intentional) while Murphy is finding comfort in Emori. It’s in the way Nyko needs Abby to heal him, and needs Lincoln to help change the minds of the Grounders about Mt. Weather. It’s in the way Jasper is reckoning with the cruelty of the world he inhabits, breaking down in tears after a fit of rage. While the eventual choices these characters make could be questionable, it’s comforting to know that The 100 is spending the early part of this season building a solid foundation of clear character motivation. Keeping in mind that the intricate story is just getting started, “Wanheda: Part 1” and “Wanheda: Part 2” are both solid stand-alone episodes, but they work much better when evaluated as a whole. “Wanheda: Part 2” fills in the gaps of the premiere, and takes its time in establishing the state of the world that the Ark peopls, Grounders, and Ice Nation share, with a nuance and depth that made the second season of this show so impactful. Murphy has found a new murderous friend in Emori! Hurray! So, it’s starting to look like the City of Light is some sort of Matrix-type thing? There’s a nice shot of Jasper, far back in the frame, standing alone in the underground tunnels of Mt. Weather, underscoring his complete isolation from everybody else. “Your daughter killed him too.” Okay Jasper, slow your roll a bit. I’m very curious to see how Jaha progresses emotionally this season. I’m down with him being this kind of spiritual visionary right now, because it fits with his feelings of complete loss from last season, but I hope there’s a little more to it. Clarke is not exactly happy to see Lexa. I’m liking the casting of Zach McGowan as Roan so far.